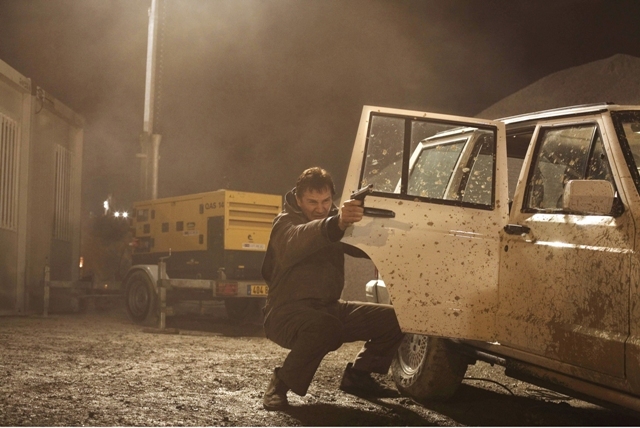 Bryan Mills (Liam Neeson) engages in a fire fight with the vicious gang that has kidnapped his daughter in Paris. “Taken” stars Liam Neeson, Maggie Grace, Leland Orser, Jon Gries, David Warshofsky, Katie Cassidy, Holly Valance, and Famke Janssen. The film was written by Robert Mark Kamen and Luc Besson and directed by Pierre Morel. It opens on Jan. 30, 2009. You can click “Next” and “Previous” to scan through this slideshow or jump directly to individual photos with the captioned links below. All photos credited to Stephanie Branchu/Courtesy of Twentieth Century Fox unless otherwise noted. Taken_01: In Taken, Liam Neeson stars as Bryan Mills, an ex-government operative who has less than four days to find his kidnapped daughter - who has been taken on her first day of vacation in Paris. Taken_02: Bryan Mills (Liam Neeson) engages in a fire fight with the vicious gang that has kidnapped his daughter in Paris. Taken_03: Only moments away from being taken by a vicious band of kidnappers, Kim (Maggie Grace) makes an urgent phone call to her father. Taken_04: Bryan (Liam Neeson) visits a streetwalker (Fani Kolarova) as he attempts to infiltrate a vicious gang that has kidnapped his daughter. Taken_05: Bryan (Liam Neeson) prepares to take extreme measures during his interrogation of a man he suspects of being a key player in the kidnapping. Taken_06: In Paris, Bryan (Liam Neeson) looks to a former ally, Jean Claude (Olivier Rabourdin), for help in finding those responsible for the kidnapping.